Franklin's EMS-RV is an extension of the innovative technology of the EMS motor starter. Franklin Control Systems has launched a new energy-saving soft-starter for use in HVAC motor applications. 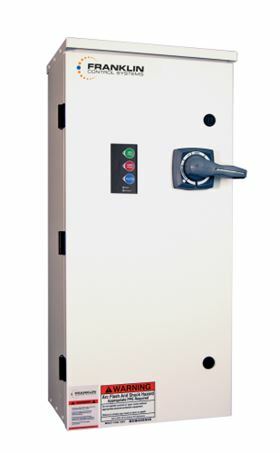 The EMS-RV, (Energy Management Starter – Reduced Voltage) is an extension of the innovative technology of the EMS motor starter, featuring cutting-edge protection and monitoring. It limits the inrush of electric current, particularly on larger horsepower motors, saving energy. Current limit is adjustable, as is the initial voltage and start/stop time. The EMS-RV’s soft start features are completed with torque boost. Soft stop modes include coast, voltage ramp, and linear deceleration. In emergency situations, the EMS-RV has the ability to start across the line. Once the motor is running, it’s protected by a programmable wide range electronic overload. The EMS-RV reduces installation time and increases reliability by incorporating common control-related elements,the companyclaims, eliminating the need for additional external components. For example, it accepts dry contact (on/off) or voltage inputs (12-120VAC/DC) for activation by control systems without requiring interposing relays. Current sensors, commonly referred to as proof of flow or status sensors, used by building control systems to detect loss of load, are no longer needed due to the EMS-RV’s on-board true power load monitoring. Using power monitoring rather than current monitoring, the EMS-RV is capable of accurately detecting belt loss or coupling shear to provide superior motor protection. Fireman’s override (smoke purge) is also standard. Installation and automation of the EMS-RV is streamlined through the use of Modbus RTU communication, and a wide range, class 5-30 electronic overload and wide range voltage operation (208 to 480 VAC) prevents installation call-backs due to mis-sized thermal overloads and nuisance trips. “This innovative starter fills the market demand for better control and increased energy savings on large motors used within building control systems,” said Andre Perra, president of Franklin Control Systems.